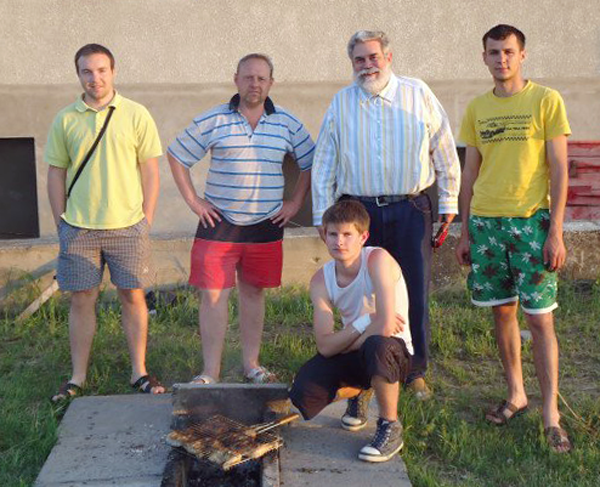 The last several days at the Odessa seminary have seen heavier study loads. I gave the students their first test (which, in Russian, is called “control work”) on Tuesday, May 17. The seminarians wanted all true/false questions because, they said, people in Ukraine disdain ambiguity in theological discussion. I compromised with some true/false but also five short essay questions. The results proved they have good retention and excellent understanding of their introduction to Dogmatics. Next were oral reports, with each seminarian given 30 minutes and a theme. The themes seemed simple on the surface, but led to deeper issues. For example, “faith” as a theme required some attention to what the Bible calls “saving faith.” Likewise, the theme of “the kingdom of God” saw the seminarian quickly identify its polar opposite, the kingdom of evil that bedevils each of us in our daily life. After sweating over the challenges of this week, word got out that Wednesday was my birthday. A rousing chorus of “Happy Birthday” in English punctuated the morning meal! Then, for the evening meal, there was silence. Literally, silence. The clock moved past 5 p.m., 6 p.m. and well beyond 7 p.m. Normally, we all take the evening meal together at 5. Something was up. With hunger pangs gnawing at my stomach, I decided to start exploring. After a few minutes, the reason for the quiet kitchen became obvious. Way out by the rear seminary gate, the students had dug a fire pit and were concocting a birthday barbecue to surprise me. Fortunately, I didn’t spoil the surprise too much since the cooking was all finished. I ran to grab the camera for a shot to share with family and friends back home. The grilled chicken was excellent, but getting it was not as simple as making a trip to the supermarket. The students first had to find the chicken, which in Ukraine took some extra reconnaissance in the neighbourhood. Our cook made a big tub of mashed potatoes to serve with the meal and whipped up a 20-layer (count them!) birthday cake and brought a jar of red tulips to grace our table. As we completed today’s topic, “The Love of Christ in Christian Fellowship,” our theme was demonstrated again and again in this spontaneous birthday surprise. Even with a test and oral reports looming, the students went out of their way to express kindness and generosity at this Odessa birthday surprise. I’ll always remember the lesson so well taught, of fellowship far from home.